That's tough love, right there. What's even crazier is that we could have a 70 degree temperture swing in a matter of two days. No wonder our roads are a pothole nightmare. I don't remember schools closing 3-4 days in succession and warnings from a local fire department about how the furnaces won't be able to keep up with this/temps will fall inside homes even with furnaces chugging away, and so on and so forth. Historic. Epic. Cabin fever, anyone? And on Saturday, when it goes into the 30s above v. below.... people are going to be ecstatic! The quiz was fun. Stay warm/stay safe everyone. Incredible weather week!!! Amazing stuff. Snowstorm leading into the coldest weather in 25 years right on the heels of it. Then warning to almost 40 by Saturday?? Unreal. We will talk about this with our kids kids. Question: Talk of snow event for Sunday into Monday? What are we hearing about that? Wouldn’t that be something?? To finish this historic week with another storm? Bring it!!! ALL RAIN, Plymouth Weather Lover all rain! Wont be finishing this "historic" week with snow! Go figure only in Minneapolis can we go from -30 to rain in 3 days. I'm not surprised living in this city and to think I thought we turned the corner from the boring winter we were having just to go back to RAIN. By the way do you see the temps behind that rain, it will be below zero again. We cant win this season!! 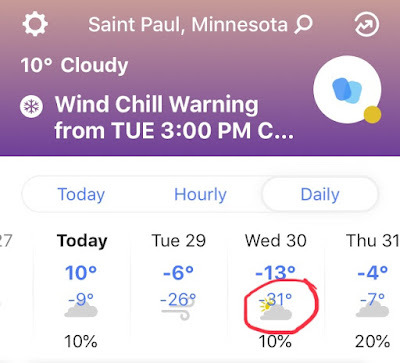 Interesting fact from Ron Trenda on his Updraft blog- "We haven’t set a record low temp in the Twin Cities metro area during the month of January since 1977." I'm curious- how many times have January high temperature records have been set in the Twin Cities since 1977? Midwest have set low temp records; Fargo and Grand Forks for example. Maybe NOAA should stop adjusting temperatures and climate data. I bet if there wasn't any global warming going on, we'd be at least two degrees colder than we're actually going to be tonight. Useless -30 then mid40s and RAIN of course, then back to below ) and dry. Worse possible place to live for snow lovers. Twin Cities winter = biggest fraud in the history of meteorology! Anonymous at 3:07 :+) Right ON! Some freezing rain/snow late this weekend and then some snow Tuesday/Wednesday and maybe back to the freezer after that storm? What are the thoughts on all of this? Bring the thoughts!!!! watched and PoPs may need to be reduced if this trend continues. PoPs were reduced a bit from the previous forecast. This warmup reeks of bust. The temp was supposed to rise to 22 by 5am. it's only 17 at 8am. No worries it will still be a 2 day thaw! the Upper Midwest late week. So be honest how many of you are already excited after you read that? or guarded because of the ways it could not materialize? Here’s a little nugget the NWS had “snow likely” for Sunday night/Monday a few days back, now it’s a wintery mix. Tuesday was also a “snow likely” day now it’s a boring 20%. Which leads me to Wednesday night/Thursday which is already at a 60-80% “snow likely” wording. What can possibly go wrong? Well well well the “snow likely” for Wednesday night/Thursday has disappeared I hope to no one’s surprise and replaced with a lot of jargon about the the storm track and moisture will be all south of us. Funny they couldn’t see the boring 12 hours ago! I am excited for multiple snow chances this week and even into the weekend/start of next week. I love this active pattern. It is so much more exciting than seeing and reading a forecast that has NOTHING on the 7-day and just a boring discussion. So i say BRING IT!!! BRING IT!! Agreed, though the chance for ice tonight/tomorrow morning does not sound appetizing. But BRING the snow, YES! PWL you must be dancing like crazy! Here we go again. Models spitting out crazy amounts of show late this week. Will be fun to watch. Mr. Lynch just reported 2-4 inches tomorrow (T) and another 6 W/Th??? Really? It is going to be an exciting week. Dance, dance, dance, PWL. I don't kow about, PWL, dancing. It seems to actually work the other way when he does. Sit PWL, sit. LOL. Here is NOAA's forecast as of their special weather statement this morning. Let's see how it plays out as the days progress:From NOAA's mouth: This week will feature two rounds of accumulating snow. One round will push through Tuesday and early Tuesday evening. The Tuesday evening commute will be impacted. Total accumulation: 2-4 inches. will push through Tuesday and early Tuesday evening. The second round will push in late Wednesday and continue into Thursday evening. Thursday commutes are likely to be impacted and Wednesday evening commute as well: 4-6 inches with the second round. Active week on tap,bring it! Haha! I love what you did there @Active. Truth be told I am a fan of snow and would surely welcome plenty of it for the line of work I’m in, boring weather during winter months are horrible. My posts although doesn’t ooz with optimism for snow shows just how inconsistent the NWS is, from “snow likely” to 20% to 2-5” that’s not helpful, they need to stay the course or not jump on any one solution per day. Perfect example is tomorrow and then look at this coming Sunday it already says “snow likely” but if you read their discussion they have very low confidence. When you say the word “likely” I don’t know about you but to me it means it will happen but then the next day you pull it and then two days later you add it back in, to me you have lost all credibility. Why not just say chance of snow(without percentages) until it’s clear it will or will not happen! Just my two cents, but as far as this week goes, LET IT SNOW!! @Boring Anonymous - I dunno...when talking about a forecast 6 days out 'snow likely' tells me that models are indicating it will snow. The commentary portion is where the 'low confidence' comes in and the reasons for the low confidence in what the models are predicting are discussed. It seems like you want weather prediction to be black/white but in reality there are so many nuances. Ha, thought i might strike a nerve :) winter weather is fickle, hard to say anything is a slam dunk especially far out, heck even in 24-48 hours as we have seen. It can be frustrating when your in line and then bupkiss. Keep that positivity flowing BA! NOAA has upped the totals: 7-13 inches through TH evening. Novak has the metro within the 'ground zero' location on his FB snow total prediction map. PWL.... DANCE. And p.s..... I know there will be people here who doubt the totals, and that's fine. I've been posting updates because I want to see how accurate they are or how off they are. That's the sentiment that started the blog... seeing how accurate forecasts were. Course I've fallen down on that goal, but it's still worth it. Point forecast (Wx Underground) for my neighborhood west of the metro calls for 10-16” Tuesday-Thursday. New thread just issued for the possibly snowy week.